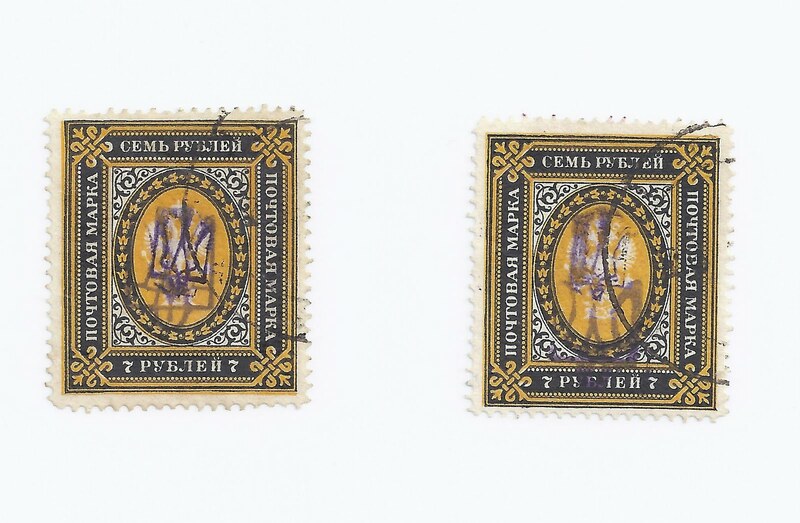 I found the two stamps above in Lot 84 of the Zelonka sale and went to Bulat to see if he listed this combination of Kyiv I and Kyiv II ( it looks like IIg to me). He doesn't. So I went to Dr Seichter's 1966 Sonder - Katalog. He does list this variety under Kyiv I as "Kiew I + II zusammen" and gives it a - - price. One of these stamps is signed UPV and the other is unsigned; both probably came from Dr Seichter's holdings incorporated into Ron Zelonka's collection. They are almost certainly philatelic rather than a genuine use of one handstamp to correct a weak impression of another [more on these in future posts], but Bulat lists many stamps and varieties which are philatelic. So it seems likely that he just skipped past this one in Dr Seichter's listing. It provides another example of why serious collectors really need to use the Bulat catalog and Dr Seichter's Katalog side-by-side. It's a pity the cancellations aren't legible. 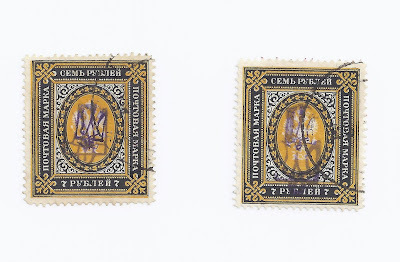 Both stamps are without gum and from the positioning of the cancels, it looks as if they were originally on paper with the cancellation tying them to the paper, rather than struck centrally as it would be if they were just cancelled to order off paper.